What's in the stock tool kit? Well, let's have a look. Your tool kit can be found under the left side chrome panel, at the lower rear of the fuel tank. 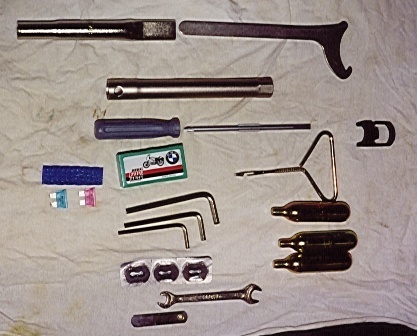 This tool kit is not intended to be able to overhaul your bike in the back woods, only to make some minor adjustments or get you out of trouble. Tool kit layed out on a rag.